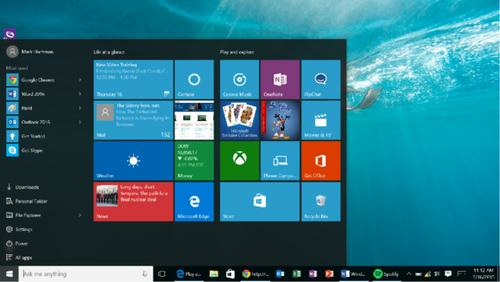 The Start menu's back, and better on some ways, melding the list view with Live Tiles. Not so much, according to Katherine Egbert, a managing director and senior research analyst at Piper Jaffray. She said in an email that because most people get a new version of Windows when they buy a new computer, the decision to offer free upgrades will have "no financial impact" on Microsoft. The company will still make money from PC manufacturers who have to license Windows 10 for the new hardware that they sell. In a similar vein, IDC analyst Al Gillen said that Microsoft has consistently told him that retail sales of Windows upgrades are a "non-material" part of its business. That's not to say selling copies of the latest version of its operating system to interested consumers brings in $0 for the Redmond-based tech giant, but that it ultimately isn't a major component of Microsoft's business. Microsoft could be missing out on millions of dollars in sales, but that's ultimately not much compared to the $93.5 billion in revenue it reported for its last fiscal year. Of course, Microsoft isn't extending the same deal to businesses that need to license the Enterprise version of Windows 10 (or its cheaper Education counterpart) but organizations that pay for Software Assurance will be able to upgrade as part of their subscription. What's more, Gillen said that offering a free upgrade is a move with "huge upside" that's going to spur consumer adoption and will ultimately benefit Microsoft. "I think it's a brilliant move," he said. "I think it's the smartest thing they could have done." In Gillen's view, Microsoft's decision to provide a free upgrade to Windows carries a massive benefit for the company: it encourages third-party software developers to build apps for the new operating system. In the past, consumers have waited to upgrade until developers have released new apps that take advantage of the new operating system, while developers have waited for customers on the new operating system before building apps. It's a vicious cycle that leads people to avoid upgrading. By allowing developers to create universal apps that run across tablets, PCs, phones and other devices, Microsoft has provided one key incentive to build and update programs for Windows 10. Encouraging consumers to upgrade by giving them a new operating system for free will further push developers to work with Windows 10. "If I were a developer, I would have a really hard time making an argument for why I shouldn't move to Windows 10 and the universal application platform," Gillen said. Microsoft hasn't publicly addressed how much of an impact it thinks the switch to free upgrades will have on its business. But company CFO Amy Hood noted during a briefing with financial analysts that the company has a wide variety of new ways to make money off Windows 10 users after they upgrade that weren't necessarily available to the company before. First and foremost, the Windows Store is a key component of the Windows 10 experience for consumers, and Microsoft gets a cut of all sales made through that venue. Hood also highlighted the operating system's improved support for gaming and the fact that Bing search is built in. All of that adds up to a version of Windows that Microsoft can make money from for years to come, even without charging users for an upgrade. That's good news, assuming the company stays the course with its "Windows as a service" plans and offers continual improvements to the operating system. Because Microsoft will be providing what will at times be major feature updates over the lifetime of a device, the company plans to defer its revenue from new Windows licenses. While manufacturers will pay for a copy of Windows in one lump sum, Microsoft will report those sales in smaller chunks over time. Gillen said that while Microsoft's finances won't take much of a hit from the free upgrade deal, PC manufacturers won't be thrilled. Because Microsoft has at least partially broken the cycle of people buying new computers to get a new version of Windows, manufacturers won't see the same bump in sales they might otherwise have received from a new release. However, he predicts that manufacturers will see longer-term benefits. While it's what Gillen calls "a little bit of a Hail Mary," Windows 10's features that benefit touch devices could encourage users to go out and buy touch-enabled computers when they need to upgrade their PCs. Overall, Gillen said the change shows that it's clear Microsoft is willing to throw out its usual playbook and try something new. "They're thinking outside the box, I'll give them credit for that," he said.